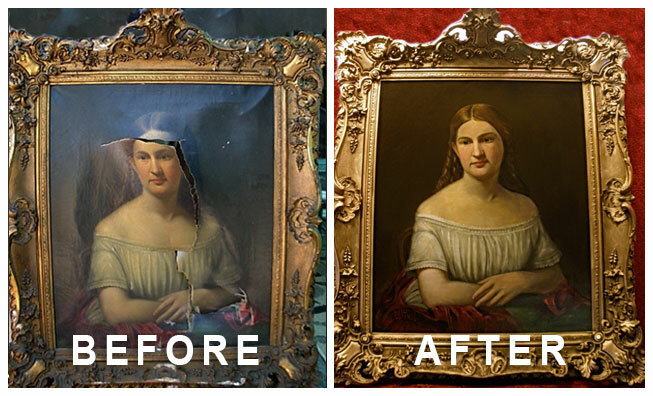 - Great damage can occur to older paintings when they are moved or stored improperly. The best way to move a painting is in the frame, with cardboard on both sides, bubble wrapped, and in at least one box. Double boxed is best. - When you remove a painting from a frame be sure to remove ALL the nails from the frame and the stretcher bars that fasten the picture to the frame. Many tears to a canvas have happened by stacking paintings against one another in a storage area and not realizing there are nails in the sides. - Whenever possible, do not remove canvas paintings from stretcher bars. It is difficult, if not impossible to restretch an old canvas without tearing it. Such a torn canvas will probably need to be relined, a process whereby a new canvas is either dry mounted or attached with hot wax to the back of the original in an effort to give it strength. 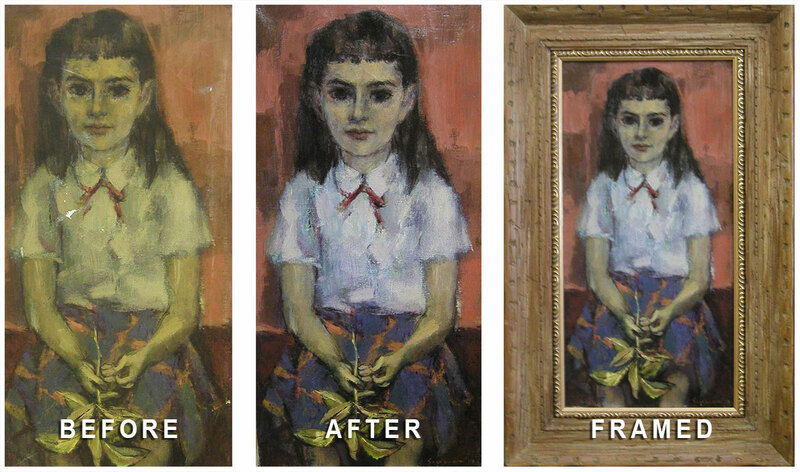 This process is expensive and in some cases can compromise the value of an important piece by covering valuable clues to its origin which are often found on the back of the canvas, the stretcher bars, and original frame. - NEVER roll up an old oil painting unless you are transporting it by camel with hordes of Vikings chasing you. If you find it off the stretchers, keep it flat between stiff cardboard, (preferably acid free) until it can be restretched. If the hordes are encroaching, be sure you roll it around a cardboard tube (preferably acid free and as large a diameter as possible) with the painting side out and wrap it with a soft cloth before putting it in saddle bags. - One of the most powerful enemies of oil paintings is water. Water, water vapor, or humidity separates the oil paint from the glue (gesso) that binds it to its ground (canvas, board, etc.) So don't wash paintings or leave them out in the rain and don't put them under glass unless you can vacuum seal them as the museums do. Often, the most troublesome repairs are those made as a result of damage caused by prior unskilled attempts at conservation and restoration. My intention is to give the collector of older works of art, in particular oil paintings, some simple guidelines on how to care for and not further, or irrevocably, damage their paintings.